Part of having a happy family life is mastering simple crowd-pleasing recipes to share with loved ones. This Mock Champagne Recipe is versatile, easy, and delicious. 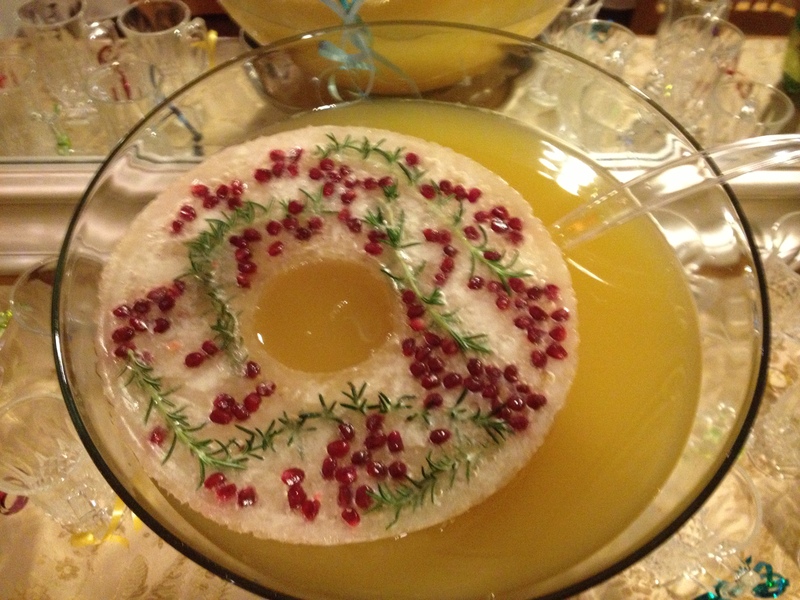 Garnish according to the season or occasion to make it extra special. Start with a 7 quart punch bowl (I purchased mine at Ross for $15.00) and pour into it chilled pineapple juice (1-46 fluid ounce can), white grape juice (1-64 ounce bottle), and ginger ale (1-2 liter bottle.) A second liter of ginger ale can be added or used to make a frozen garnish. For Christmas, I made a “wreath” (pictured) by freezing ginger ale, fresh rosemary, and pomegranate seeds, in a plastic bowl with a weighted plastic cup to form the center hole. For a Baby Shower, I simply floated fresh raspberries. Now I’m wondering how to fancy up a New Year’s punch. Any suggestions? This entry was posted in Food, Lifestyle and tagged Christmas, Family, Holidays, Recipe. Bookmark the permalink. What about something in a star shape for New Year’s? To symbolize fireworks. When I was a girl, they’d put a whole half gallon of a sherbet ice cream in the punch to keep it chilled and make it kind of creamy, for most of the wedding receptions I went to. 🙂 I remember watching that block of ice cream getting smaller and smaller, lol.